United States Secret of State returned to work on Monday after almost a month of health problems. 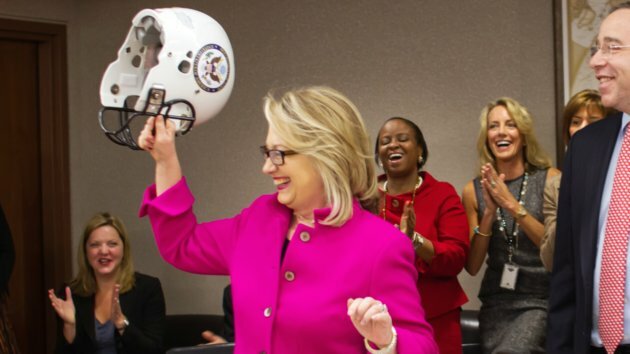 The State Department released some cheery photos of Clinton being presented with a football helmet by her staff, before chairing a weekly meeting of assistant secretaries. Clinton was recently released from a New York City hospital where she was treated for a blood clot, in a vein between her brain and skull. The clot was brought on by a concussion she obtained in December when she collapsed at home due to dehydration. The 65-year-old, soon to be retired secretary, was presented with the football helment, for extra protection, and a football jersey with the number 112, representing each of the countries she has has visited while working in this position.